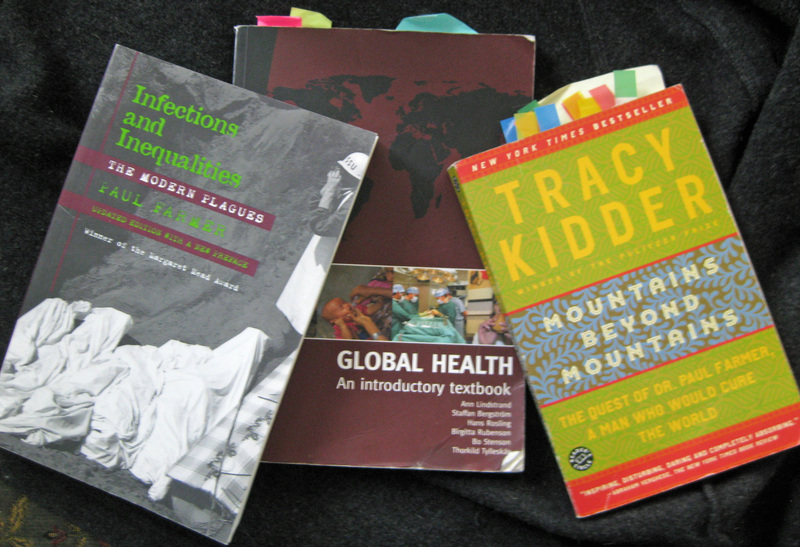 A few of my global health required readings. TACKLING AND TALKING ABOUT ISSUES in global health is easier with so many brilliant professors, doctors, and scientists living and working in Seattle. 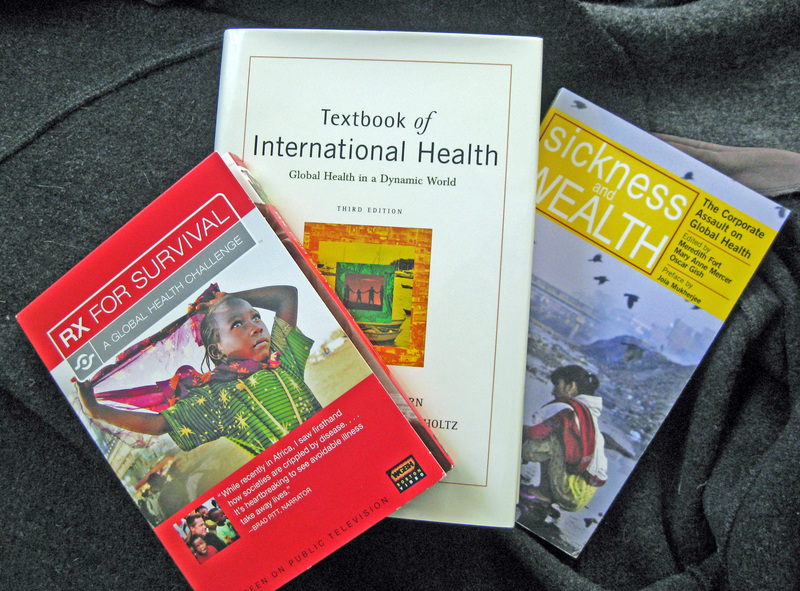 Books that help guide the ‘whys?’ of global health. For example, full credit goes to the University of Washington’s Dr. Stephen Gloyd and Dr. Matthew Sparke for making global health easier to understand by framing it into four key pillars, with provocative questions tied to each one. Some of these themes and questions are theirs verbatim; others I have reworked, simplified, and boiled down to just five questions. This is just a small sample, a bit of food for thought. Where I could easily link in answers, I have. Please use these themes and questions as a framework to spark conversations with like-minded global health seekers. A) How do we define and measure global health? Why is it so hard to come up with one solid definition? B) What parts of the world and what specific countries have better or worse global health (‘burden of disease’), and why? How can you tell? (Hint: health indicators and health determinants). C) Diseases can be broken down into categories, such as acquisition; transmission; chronic vs. infectious. How do these categories differ, especially for treatment and in relying on a healthcare system? D) Play the acronym game of global health organizations and terminology–the literal ABCs of global health. 2. GLOBAL HEALTH DISPARITIES – WHY? A) What are key health determinants, and why are there such disparities in illness and disease, internationally, nationally, and locally? B) How are global health disparities distributed by gender, class, and ethnicity in a specific country, a region, a continent? C) How does education, family income and national income, a sense of community, and access to land, water, and other public resources affect health and sickness? How do ‘people on the move’–along with their livestock–help spread disease? D) What are the ramifications when food is unevenly integrated and distributed in countries, and how does that influence health and sickness? B) What are the differences, and the different approaches between a medical focus on acute, contagious diseases and a public health focus on chronic diseases and the long-term health of a population? C) What are the ties and tensions between ‘vertical’ disease-specific policies and ‘horizontal’ health system policies? How are we to understand them? D) How have policies such as export-led development, debt discipline, austerity, and privatization affected health systems and health outcomes? What are the ties and tensions between official national government health aid, agencies such as the UN and WHO? And how have philanthropic organizations, NGOs and pharmaceutical companies helped shape global health policy? A) How have development aid and NGO-led projects helped or hurt efforts to improve health in different countries? C) How does war affect health? D) What ‘best policy practices’ have improved overall health and equity? –“RX for Survival: A Global Health Challenge“ (PBS series/ DVD and website), narrated by Brad Pitt. I’ve very visual, and find this 3-DVD set absolutely riveting in explaining global health diseases and infections, and in using storytelling to offer history lessons and solutions. —Textbook of International Health: Global Health in a Dynamic World (3rd edition), by Anne-Emanuelle Birn, et al. It’s thick, comprehensive, and utterly fascinating. —Global Health: An Introductory Textbook (2008), by Ann Lindstrand, et al. Comprehensive, easy-to-understand book written from a public health perspective. —Bill & Melinda Gates Foundation web site. If you have time to dive in, this rich, vast web site is filled with solution-focused stories of their global health initiatives and progress. My favorite (very visual) is the “Living Proof” section. —Gapminder. This addictive web site shows how the world changes when global health statistics are shifted — like malaria, or maternal mortality. Love this site! —Standard global health readings usually include everything by Paul Farmer, but especially Infections and Inequalities: The Modern Plagues and Pathologies of Power; Tracy Kidder’s Mountains Beyond Mountains; House on Fire: The Fight to Eradicate Smallpox by William H. Foege; and Sickness and Wealth: The Corporate Assault on Global Health by Meredith Fort, et al.